Hilton (NYSE: HLT) today announced the signing of a management agreement with Myanmar partners Crown Advanced Construction Co. Ltd to operate a 308-key hotel near downtown Yangon, Myanmar. 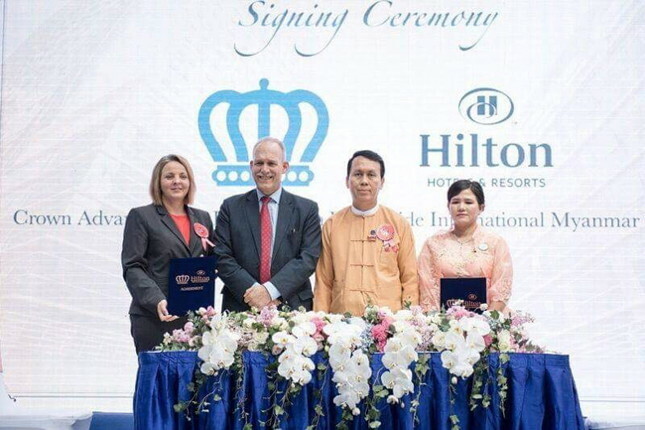 Hilton (NYSE: HLT) today announced the signing of a management agreement with Myanmar partners Crown Advanced Construction Co. Ltd to operate a 308-key hotel near downtown Yangon, Myanmar. Hilton Times City Yangon marks the company's continual expansion in Myanmar and will be its first hotel in the Myanmar city when it opens in 2022. "It is an exciting time to be expanding our footprint in Myanmar, with an optimistic outlook for inbound tourism and the country expected to receive 7.5 million tourists by 2020. As the commercial and financial capital of the country, Yangon holds much of the potential for growth. We are delighted to be bringing our Hilton brand into Myanmar's largest city to cater to the projected travel boom. There is no better way to kick off Hilton's 100th year anniversary than with a milestone announcement such as this, and we are confident Hilton Times City Yangon will be top of mind for leisure and business travelers alike, whether they are passing through or visiting Yangon," said Paul Hutton, vice president, operations, South East Asia, Hilton. Hilton Times City Yangon will feature five dining outlets, including an all-day dining restaurant, one specialty restaurant, two bars and a Grab and Go outlet. Guests can hold meetings and events at the hotel's event spaces spanning nearly 1,250 square meters, including a ballroom of over 550 square meters. There will also be a business center, a fitness center and a spa, as well as a pool for guests to work out and unwind. "We always seek to grow our brands in the right location, with the right partners and we are honored to have the chance to work with Crown Advanced Construction Co. Ltd to bring our Hilton brand to Yangon. With the increase of flight connectivity to Yangon, growth in multinational companies setting up operations here – combined with an influx of foreign investment – business travel is anticipated to grow very strongly and the close proximity of our hotel to government embassies and downtown Yangon is a great advantage. Hilton Times City Yangon will be ideally positioned to cater to leisure and business travelers when it opens in 2022," said Guy Phillips, senior vice president development, Asia & Australasia, Hilton. "Hilton as a brand is recognized across the globe, and people know it for the great guest experiences and quality stays they can expect at any Hilton hotel. We are delighted to have found a great partner in Hilton to build and operate our first hotel, and we are confident that it will be one of the most highly sought after accommodation venues for any traveler coming into the city," said U Myat Min, Project Director, Crown Advanced Construction Co.,Ltd.